I like this weapon but how about a good shield to go with it?.. anyone got a link? Not sure if you're still checking this looking for a shield, but I'd say one of the best shields I've found is the ample wooden shield. It's really easy to get and awesome in terms of ac. Great for low lvls, so you might be looking for something better, but you could easily camp it if you wanted with someone in the 40's. I just bought this for my lvl 39 Pally for 8k in the Bristlebane Bazaar and he's hitting an average of 75 per hit with max so far of 109. He was using a Longblade of Vitality(which only has 18 damage at this level) but he'll be using this until the LBoV is maxed(lvl 56 if I recall correctly). He might even keep both ready with hot-buttons(Bandolier) for each. 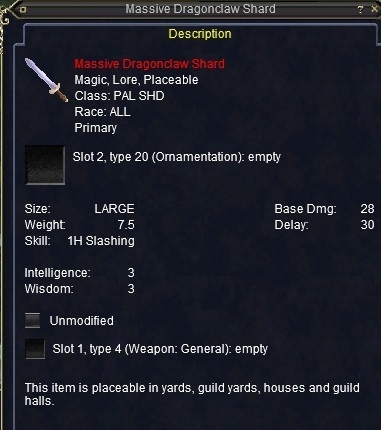 I picked this sword up in the bazaar for 7500pp on Xev server 2 days ago.Even at lvl 25 I was hitting for low 80's.Now at lvl 29 hitting for high 90's with 225 str.Basically with double attack and bash I am plowing thru mobs fast.Will be my choice of 1hs till I can get into some of the high end stuff.Definatly worth the money. Add a haste item for around 2k and you can reducy delay by 21%... Hmm Delay 30 minus 21% for roughly 24. Delay 24, Damage 28. You've just entered the realm of Godly. Haste calculations is a bit off. So when you have 100% haste your weapon delay is 0 ? Doesn't make that much of a difference in this example, but when you take 100% you see the mentioned difference between a 0 delay in your calculation and a 15 delay in the correct haste formula. I had bought this very nice 1hs when I was 35 or so replacing my Noct blade, now that I'm 46 with 210 str I can hit for upto 115 and I average about 60-80dmg a swing. This sword costs me quite a bit but it was worth every single pp. I purchased one of these for my Level 13 Pally and love it, until I get to the levels where things like a longblade of vitality become an option, this seems to be the one to go. Very chintzy on the ability modifiers, but those are inexpensively augmented by other gear. Even at 13 I am routinely making damage hits in the 30s with this sword and it will only get better. Paid 12k in Errolisi Marr's bazaar for it. Not since I got my argent protector have I been so excited! Just got this sword for 5k plus a wurmslayer on bristlebane! Granted, it's stats aren't as good as the ap, but I get to use my Shield of Stalwart Seas again which ads much needed AC, STR and STA! These are incredibly expensive, I almost wonder if is still drops. I bought mine at a real bargain for about 7K and haven't seen one for less than 20K since. Still the best tradable 1HS I can find, and I look over the bazaar every chance I get. There are some fantastic weapons coming out of LDON and POP, but they're NO DROP and have high recommended or required levels. I bought this for my SK for 5k and to say the least im still pumped that i have it. Now he is lvl 29 and has a high single hit of 103 with a one hander i have to say that i was amazed. Thats non crit of corse and it averages about 60-65 each hit dropping mobs like no other. If you can afford one get it you wont regret it. This...or A Jeldorin for a 49 Pally? Can anyone tell me what the graphic on this looks like? Yeah, it looks like a sword. i have seen several mentions about the 1hs with shield vs 2hs..if we are talking uber lvls to compare damage then 2hs would be better.. AA points alow u to bash with a 2h wep so that comment becomes null. and if u are a melee type u will have some sort of haste item, com or cof, rbg etc. I've used this since lvl 15 on my paladin and I am now lvl 57 and still use it :). If I am MT then I think it's better to use 1hs with a shield that has good resists, but if i'm standing behind the mob I switch to more powerful and get up to 400 crit with AA. i got one for 10kpp in the bazaar on solusek ro server. When i purchased it, there were 2 others for sale for the same price. Is it really that more expensive on other servers? down to 13k on luclin, 10k sounds good, its a nice wep. #rleon, Posted: Dec 23 2002 at 12:43 PM, Rating: Sub-Default, (Expand Post) who drops frostbringer or is it quest-realeated? #rleon, Posted: Dec 23 2002 at 12:42 PM, Rating: Sub-Default, (Expand Post) where do you get windblade? #Kanvarwen, Posted: Dec 01 2002 at 12:27 AM, Rating: Sub-Default, (Expand Post) I wish to buy one of these on Ayonae Ro, please send me a tell in game and we can work out a deal, thanks ahead of time. This is an awesome weapon, both in form and function. I get compliments regularly on the damage. It's made the game sooo fun for me! There are a few truly great weapons out there, and this is one of them. If you own one, you'll love it. Period. My 51st Erudite SK totally rocks with this toy. Combo'd with my Massive Umberhulk Shield, and RBG all shall fall like blades of grass before my feet. #NeonBlack, Posted: Oct 03 2002 at 1:53 PM, Rating: Sub-Default, (Expand Post) You all need to move out of your parents basements and get a life. Jobs and girlfriends work nice. And stop picking your zits in public, losers. I have one it totally owns I've finally given up 2 handers and taken on a shield.